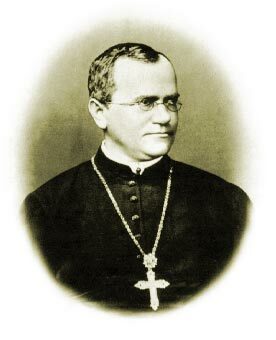 A scientist and monk by the name of Gregor Mendel (1822 or 23 - 1884) contributed significantly to the understanding of genetics in the 1800s by being the first to actually count numbers of offspring in crosses involving pea plants. He is often called the father of genetics. Did very well in school but to get more education he became a monk and attended the University of Vienna. Over a period of 7 years he bred and counted about 28,000 pea plants. Character - a heritable feature. Trait - a variant for a character. Offspring of two members of the F1 generation comprise the F2 generation. Mendel repeatedly came up with the same results when examining seven pairs of contrasting traits. Mendel called the trait expressed in the F1 plants the dominant trait and the trait not expressed was recessive. 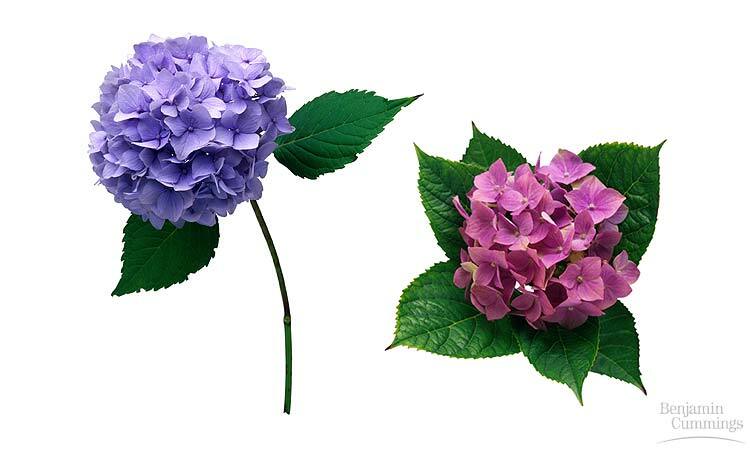 When the F1 plants were allowed to self-fertilize, Mendel found 3:1 dominant to recessive phenotype in the F2 generation. Fig 14.4. When F2 plants were allowed to self-fertilize, Mendel found a 1:2:1 ratio of true-breeding dominant to not true-breeding dominant to true-breeding recessive. Each individual has two genes (Mendel's "factors") for each trait. When both genes are the same, the individual is said to be homozygous for that trait. If the two genes are different, the individual is heterozygous for that trait. Phenotype refers to the outward expression of the genes. Punnett Squares - an easy way to express the probabilities of genotypes. image and image 2. The Testcross - When Mendel did not know the genotype of an individual expressing a dominant trait, he did a test cross by crossing the individual with a homozygous recessive for the trait. Fig. 14.6. Exceptions to Mendel's Laws - Remember Mendel did not know about genes or chromosomes. The following are other ways that genes may express themselves. Incomplete Dominance - when offspring exhibit a phenotype intermediate to that of both parents. Fig 14.9. Codominance - 2 alleles affect the phenotype in separate distinguishable ways. Ex: MN blood factor. More than two alleles exist for a given trait in a population of individuals. Polygenic (multiple genes) inheritance or continuous variation - when one trait, such as human height, is determined by the action of several genes, it results in a continuous variation for the trait within a population. image of human height variation. Human skin color Fig 14.12 and eye color are also determined by multiple genes. Some either/or characters in humans include presence or absence of a widow's peak (dominant), attached (recessive) or free earlobes. We can chart a family tree or pedigree based on these either/or traits. This is more commonly done when there is a history of a family disorder, as below. Both parents must have the allele to have a child born with the condition. Even if both parents are carriers, they only have a 1-in-4 chance of having an offspring with the condition. Cystic fibrosis - most common genetic disorder in Caucasian Americans; 1 in 25 is a carrier, 1 in 2500 is affected. Chloride channels that enable the passage of chloride ions are absent or defective so that the chloride ions build up and cause a thickening and accumulation of mucus in the lungs, pancreas and other organs. This hampers breathing and other functions and also allows for a greater chance of infection. Red blood cells become distorted into sickle shape in low oxygen. Mutation is in the gene for the B chain protein of hemoglobin. Hemoglobin S has a substitution of one amino acid, causing the chain to coalesce into crystals that distort the red blood cells. Persons with one S allele and one normal A allele do not have the condition, but are called carriers because they can pass the gene on to their offspring. Malaria is caused by a protozoan parasite transmitted by the Anopheles mosquito. Some of the life cycle of the parasite must be spent in human red blood cells. Autosomal Dominant Disorders Pattern of Inheritance - single "faulty" allele of a gene causes damage, even with a "good" allele present, because the "faulty" allele is dominant. ALS, Lou Gehrig's disease, is also a degenerative neural disorder. Genetic counseling can help couples predict the risk of bearing children with genetic defects. Carrier recognition. Amniocentesis - a minute amount of amniotic fluid surrounding the fetus is removed and checked for genetic defects. Performed at 4th month of pregnancy. image. Chorionic villus sampling - removal of a small portion of the chorionic villi of the placenta for genetic testing. Can be done earlier in the pregnancy, is less invasive, and yields results more quickly. Ultrasound allows for viewing of the fetus without harming it.